Today was a killer day for flying HL. The forecast blowout did not materialize this morning and did not ever get over about 8-10 with a few brief gusts to 15. Despite the persistent overcast, the lift was there and quite abundant. There were a couple of disappointments but nothing that cannot be repaired. If you weren’t there, you can kick yourself for missing a stellar opportunity to see some HL that was really KA. Bill was very competitive in the early rounds and I kept finding myself saying, “why did I sell him my good planes?” He was leading through the first three rounds before a great round four put me in the lead to stay. Somewhere around round five Bill started having trouble finding the box and suffered a prolonged series of landouts that really took him out of contention. 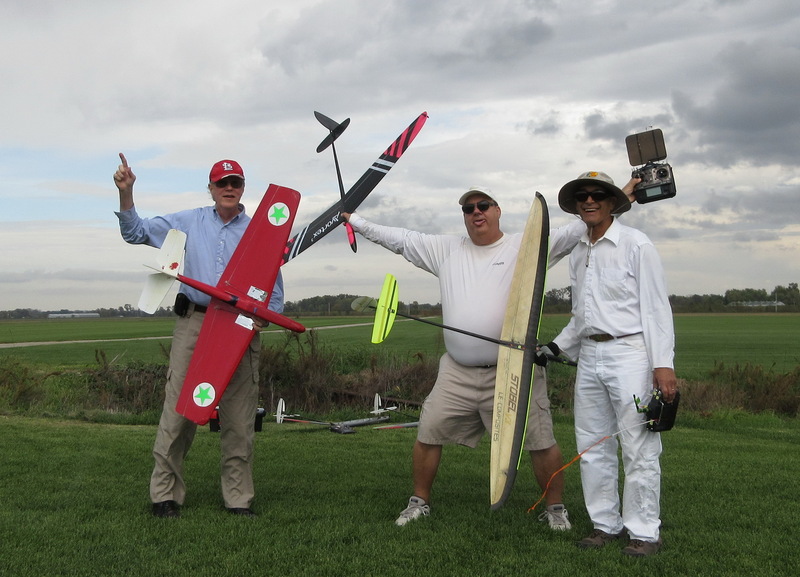 I flew my new Vortex 3 for all rounds, though a couple of hard downwind dorks made me worry about breaking it. As the breeze came up in the middle rounds I put in a 13g ballast stick that settled things down a bit. Later I tried a 25g stick but that proved to be too much and I took it back out. (could have just been a couple of flights in strong sink but I blamed the ballast.) About the time I took it out the air improved and the last few rounds had some pretty fun flights. A shower came up and ran us off after round 11, but as soon as we had packed up, the rain ended, the wind died, and the sun came out. I’ll bet the lift in the afternoon was even better than this morning. The full file is attached if you want to look at the play by play. I have pasted in the final results below. It was a really fun day. I wish a lot more of you had come out to see it. btw, we have two more contests left this season; HL on Nov 4th, and Unl/2M on the 11th. See you there. It was a great day for a contest. I did well in the early going, as I’m used to sport flying in the lower winds we had in the first few rounds. I didn’t do so well the later rounds after the wind picked up, but did not damage the Stream I was flying. Landing outside the boundaries to get a zero for at least 1 of the 3 flights in rounds 5 through 8 didn’t help at all. Guess I need to practice in higher winds. I flew the second Stream that Wayne sold me for the first time before the contest started, but chose to fly my other one in the contest that is 10 g heavier due to a few repaired dings. Actually, I was fooled by the charger beeping when it reaches the point of decreasing the current from the 1C rate. By the time the current got down to zero, I had 222 mAhr put back into the charger, so very similar to Wayne’s result. Still safe for a lot of flying. Hi Flyers: Yes, my best rounds came after I went to the Stobel. That is because it was the only plane I did not crash. But the damage is minimal. The Tweagle only broke the wing in several places, the fuse in several places and one servo gear. The XXLite only broke the fuse in several places. Mere flesh wounds. It could have been worse. Not much but ….